I had a fascinating afternoon yesterday at a field day outside of Alta Vista, Iowa sponsored by Practical Farmers of Iowa, Organic Valley and MOSES. The Frantzen family raises organic hogs and beef for Organic Valley, which I’m sure you’ve seen their products in the natural and organic section of your local supermarkets. 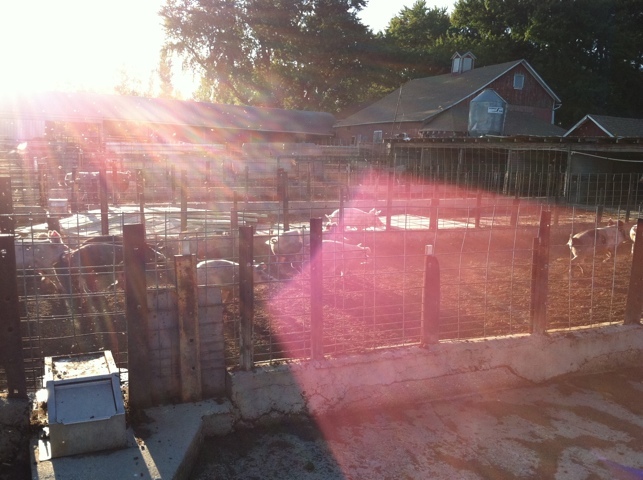 The field day was held at James Frantzen’s farm, that he just purchased and is in the process of fixing up and readying his buildings for farrowing pigs. He gave a presentation about his start as a beginning farmer (he’s only 23) after a stint at Organic Valley in Wisconsin, and the joys and pitfalls he has experienced thus far. The building that he renovated from an existing old horse barn, houses 16 sows that are farrowing, meaning that they have their baby piglets and are kept with their Mommas until they are weened, which is around 6 weeks. 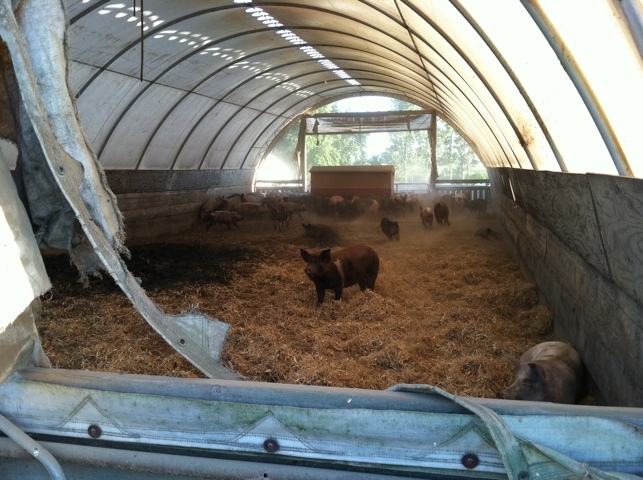 He is organic certified and the buildings cannot be confined, they have to have windows, they cannot have slats or pits for manure, they have to cleaned weekly and given fresh bedding, and the sows have to have space to turn around and lay down. He fixed up this building and put in all of the plumbing pipes, electric work, and pens for around $5,000. That will pay itself back in no time at all. 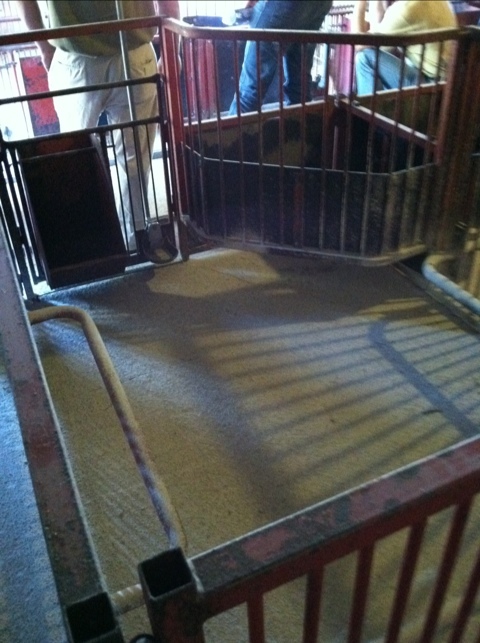 The liquid manure runs outside the pens and flows down these cement aisles using gravity. 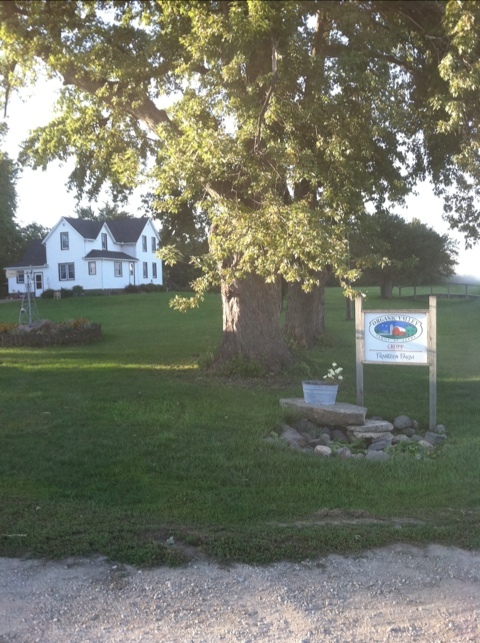 Because he farms with his parents, I was curious to see what his parent’s farm looked like. It is where the sows are artificially inseminated, and where the hogs are weened and fed out until they are ready for market. 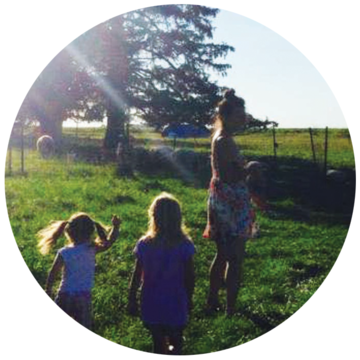 On that farm also stands a small feed mill business, organic cows, and 300 acres of tillable ground where they grow organic corn and soybeans, mostly used as a feed source for their livestock. 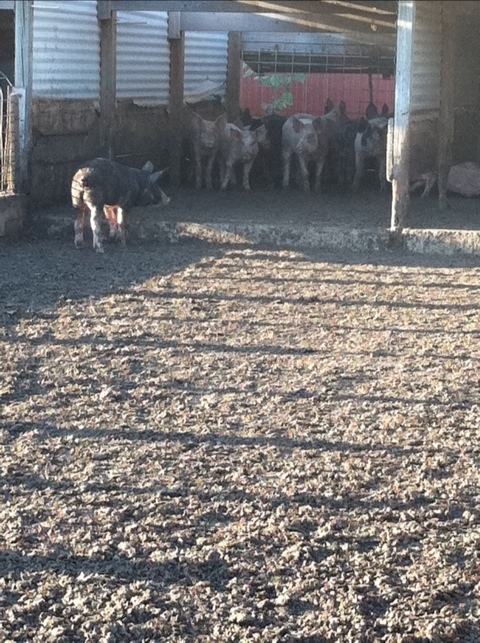 Notice how the pigs all have access to the outdoors and have room to run around. 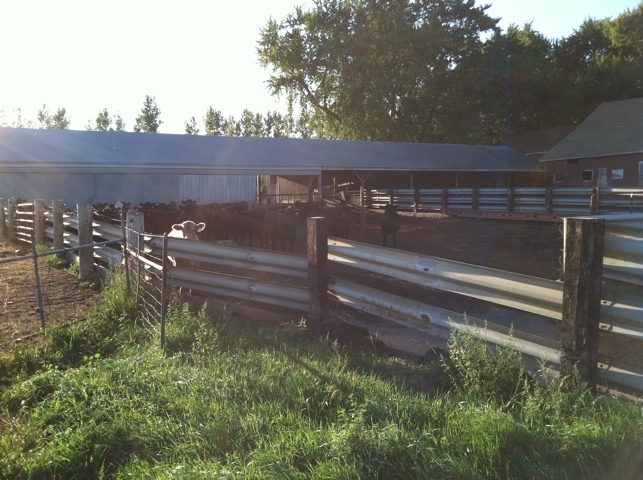 There are no slats or pits whatsoever, so all manure has to be loaded by hand, or skidloader, and placed in a compost pile for fertilizer use in the spring and fall. This entire method of farming is like it was before the 1980’s when hog confinement units were created to increase hog production. These pigs looked like my dads old Farmer Hybrid pigs that he used to raise from farrow to finish. They were raised exactly like this and would be considered ‘naturally’ raised today, (not organic because they were not fed organic grain, were wormed and given antibiotics, and did not come from organic genetics). 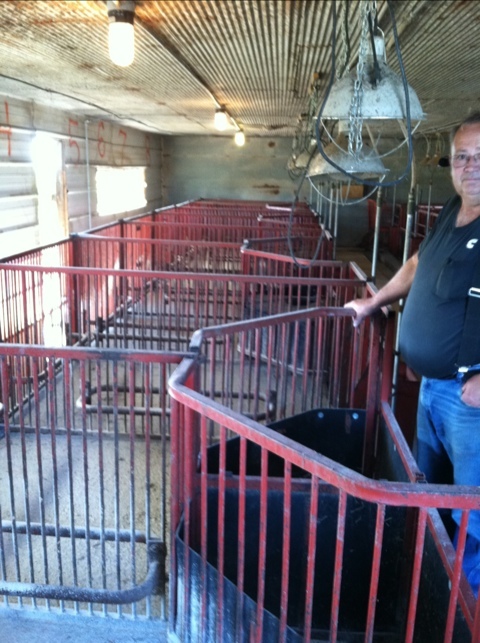 He made his money when he transitioned to confinement units because he could raise pigs through the harsh winters and he could have more sows farrowing at one time. Confinement units were created for higher efficiency and higher production but did not consider the welfare of the animal as much. This is where the controversy stands and what today’s consumer has to decide when making their meat purchases. These pigs on the Frantzen farm looked healthy and vibrant. The smell wasn’t as strong as confinement units with pits, and the pigs looked natural, not like the pigs that are so lean that they don’t have any fat to protect them from the cold and are so super muscular and stocky that they look like weird animal anomalies. If you have ever tasted the meat of a naturally raised hog and an organic hog, you know the difference in texture and flavor compared to the cheapest pork you can buy at your grocer. It’s amazing! I recently met with a field agent from Niman Ranch, a natural meat company based out of northern California. Iowa farmers can raise only pork for Niman, not yet lamb, chickens or beef. It was a very informative and interesting meeting for me as I think about raising natural pigs on our small farm. I want to make sure there is a market for the hogs I raise, I want to make sure I can make a profit, and I want to make sure my hogs are treated humanely from start to finish, and that includes processing. 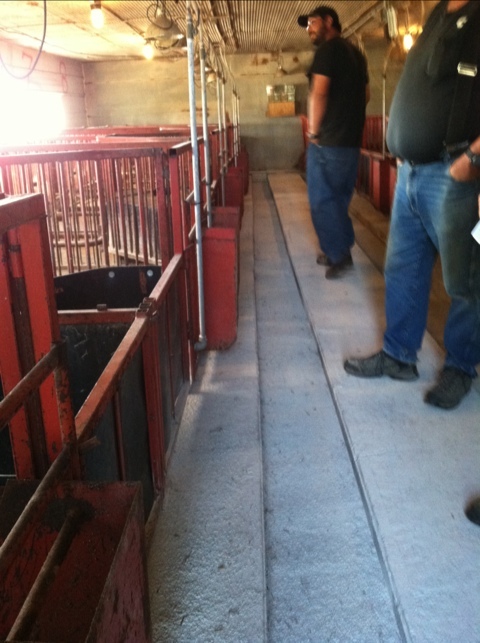 It just so happens, that Organic Valley and Niman Ranch process their hogs at the same facility in Sioux Center, Iowa. The facility is one the first in the Midwest, designed by Temple Grandin, the genius behind the humane treatment of animals before and on their way to be processed. Because of her autism, she has a heightened perception and reaction of how animals feel, and has observed the reaction of animals when under stress. I highly suggest you read her book and/or watch the movie based on her life. Here’s a short clip of Dr.Grandin talking about the humane stunning of pigs during processing. 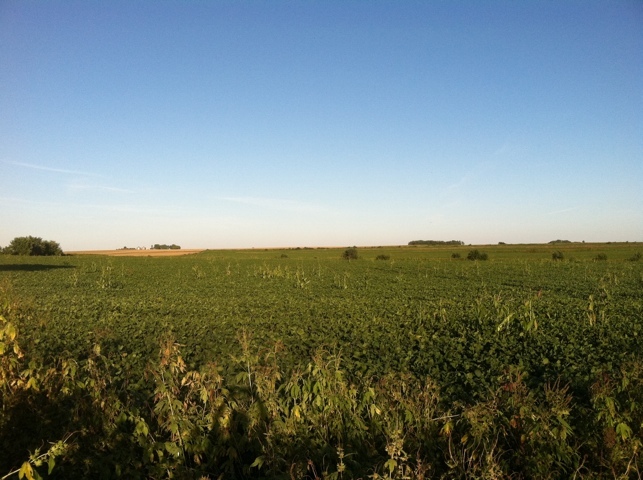 To feed the Organic Valley pigs and cows, the Frantzens grow organic corn and soybeans. 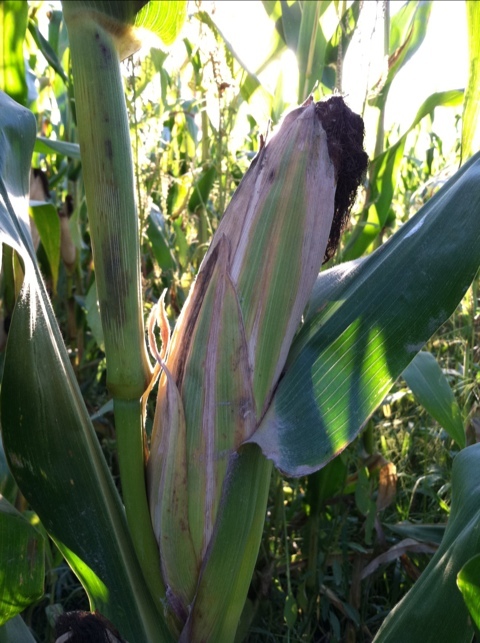 Here are a few pictures of their fields and ears of corn. 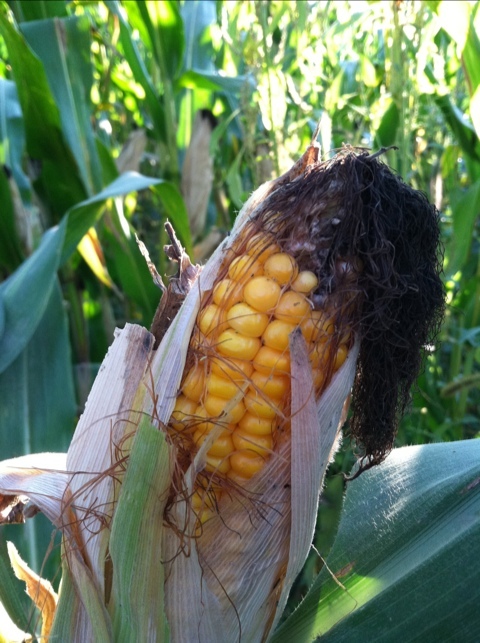 They use a corn picker to harvest their corn so the corn is harvested as a whole ear. They then shell the corn with a sheller. It is a labor intensive process, but that’s why they receive $12.35/bushel versus the conventional market value of $7.35/bushel (these numbers fluctuate with the markets). These success stories make me very happy! It means that the U.S consumer as well as parts of the world, want better meat. And their definition of better is naturally raised or organic. To raise these types of meat products, a smaller and less intensive style of farming and raising livestock is favored. 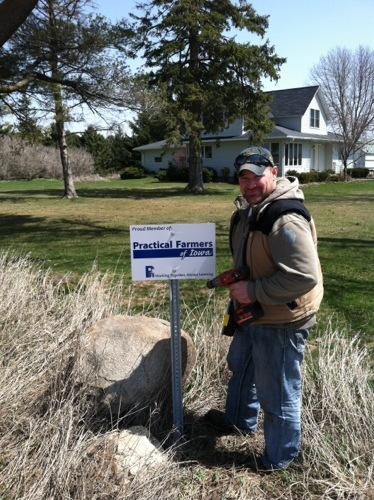 Family farms LIVE on!